Book News: The 'Dickens Of Detroit' Leaves His Collection To South Carolina : The Two-Way Before his death, crime novelist Elmore Leonard chose to host his archives at the University of South Carolina. Now, the school is unveiling the first of these items. Also: McSweeney's goes nonprofit. Elmore Leonard was famously picky with his words — but not with his papers. He left behind more than 150 boxes, or about 2,400 linear feet, of documents. 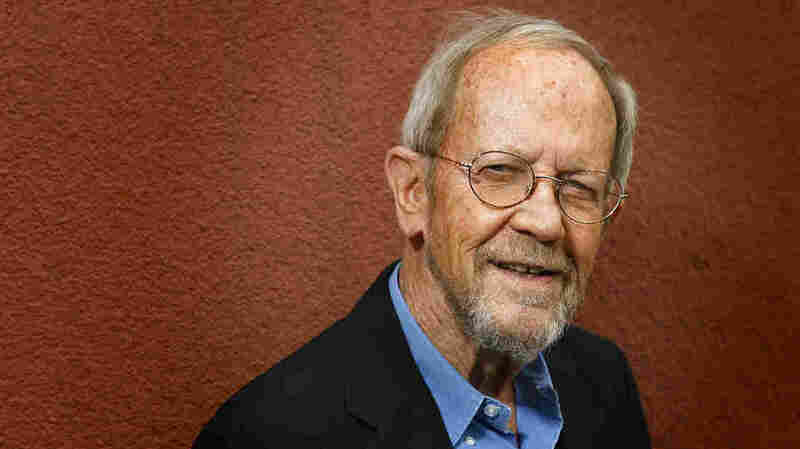 In a bit of a twist, the archives of the late, great crime novelist Elmore Leonard have come to rest at the University of South Carolina, the school announced Wednesday. Leonard, long known as the "Dickens of Detroit," chose Columbia, S.C., over the Motor City to house his collection after visiting the school last year, just months before his passing. It was Leonard's tour of the university's literary archives — a walk among the original manuscripts of writers such as Ernest Hemingway and George V. Higgins — that persuaded him. And the choice came quickly: On the flight home to Detroit, Leonard made his decision, according to his son, Peter. While Leonard was known for his spare writing style — he "had a contempt for putting pretty clothes on hard, direct words," NPR's Scott Simon remembered — he left behind his fair share of those words. More than 450 drafts of manuscripts, ranging from his early Westerns to his best-known novels, will join scrapbooks, typewriters and even a few Hawaiian shirts in the collection. Samples of the archives went on display Wednesday, and The Associated Press reports that the whole collection is expected to be ready for researchers' eyes in about 18 months. McSweeney's Makes A Change: McSweeney's is going nonprofit. Founder Dave Eggers says he hopes that the San Francisco publishing house — the force behind a number of books, the magazine The Believer and, well, McSweeney's (the quarterly literary journal) — will become a 501(c)(3) group within a year. Eggers tells the San Francisco Chronicle why: "You know, the taste of the editors and the staff ran toward really worthy books and worthy undertakings and anthologies and series that ... didn't necessarily indicate profit." Stretch Break: Electric Literature has an infographic's bounty of useful yoga poses for writers who, really, are hoping mostly just to dodge the blank page. Stretches include "Navel-Gazing Poet," "Blurb-Begging Novelist" and, naturally, the "Plot Twist." Klein's Prize: In a week thick with awards, it's best not to forget neglect our friends north of the border. Journalist and activist Naomi Klein has won the Hilary Weston Writers' Trust Prize, Canada's richest prize for nonfiction ($60,000), for her book This Changes Everything: Capitalism vs. the Climate. Klein hopes the prize helps expand the book's otherwise "lefty audience," the writer told Publisher's Weekly. "It's all about having the debate, and you can't have the debate unless everybody is talking to each other." Before The Afterlife: Oh, and you heard, right? Wolverine died Wednesday. But be calm, says Glen Weldon: He's not dead dead.